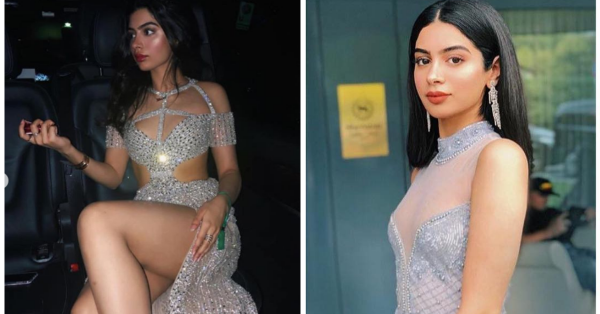 We spotted a photo of Khushi Kapoor glittering in a custom designed Falguni Shane Peacock gown at the hush-hush Ambani-Piramal engagement in Italy. And damn, she was a sight for sore eyes! What's better than that gorgeous glittering gown is Khushi's poppin' highlighter. Love the look as much as we do? Here's a quick breakdown of Khushi Kapoor's makeup look from Isha Ambani and Anand Piramal's (almost) secret engagement ceremony at Lake Como. Khushi's outfit was pretty sparkly. If you are looking to recreate a makeup look for an OTT outfit, it would be a good idea to keep the makeup minimal. 1. You want to start with a good base. A photo-friendly foundation that has good coverage will work. The Wet n Wild Photo Focus Foundation (Rs 599) is perfect. 2. Skip eyeshadow and eyeliner and apply a few coats of mascara instead. A lengthening formula like the L'Oreal Paris Voluminous Lash Paradise Mascara (Rs 799) that gives your lashes dimension and depth is perfect. 3. If you have great cheekbones like Khushi's, sweep some blush just under your cheekbones. A blush with a subtle luminosity like the Milani Baked Blush - 05 Luminoso (Rs 1,050) is perfect for a night function. It will make your cheeks glow under all the right light. But if you're getting dolled up for a day function, pick a matte blush like the Maybelline New York Color Show Blush - Fresh Coral (Rs 240). A shimmer blush will accentuate any texture on your skin and it will be more visible in the daylight. 5. A poppin' highlighter is an absolute essential if you're trying to recreate Khushi's look. A highlighter with a golden undertone like the Maybelline New York Face Studio Master Chrome Metallic Highlighter - Molten Gold (Rs 550) is made for most Indian skin tones. Sweep it along your cheekbone and on the bridge of your nose. If your outfit permits, add some along your shoulder and collarbones too!